This post is brought to you by Varathane. All opinions expressed are my own. 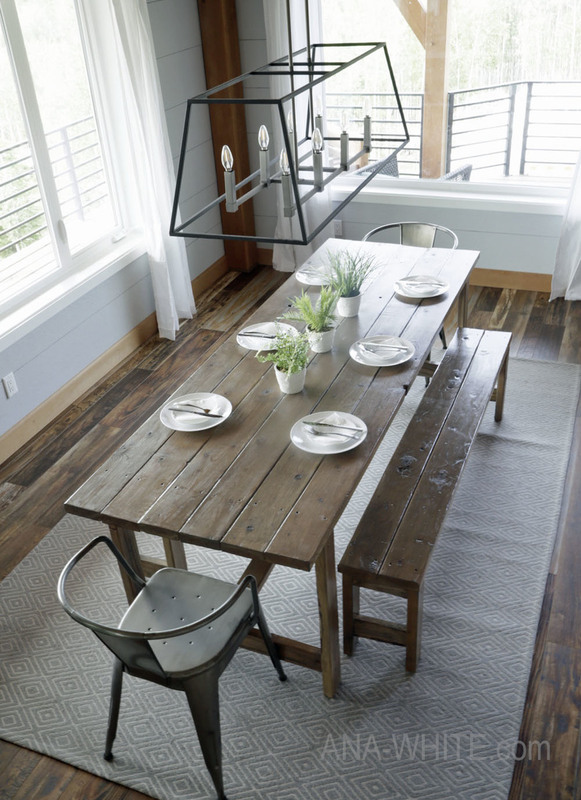 Weathered grey tones are a neutrel way of adding texture and dimension to a room, without cluttering a space with different wood hues. It’s no wonder the grey trend is so in right now. 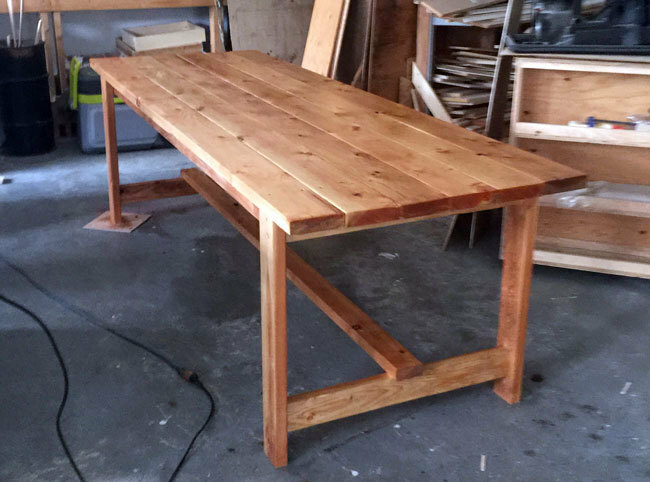 Last year, I built the Two Tool $50 Farmhouse Table, and finished it with a natural wood finish. 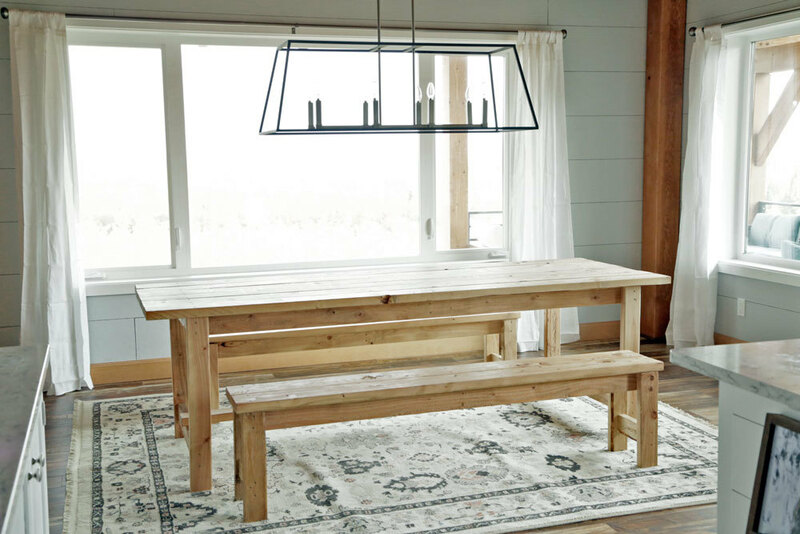 We love the table and it’s still very sturdy and useful. But I felt the color was a little too matchy-matchy to our wood ceiling, and wanted to add a grey tone to it. But didn’t want to sand down the finish and start all over again. In one simple step that also adds a protective top coat. 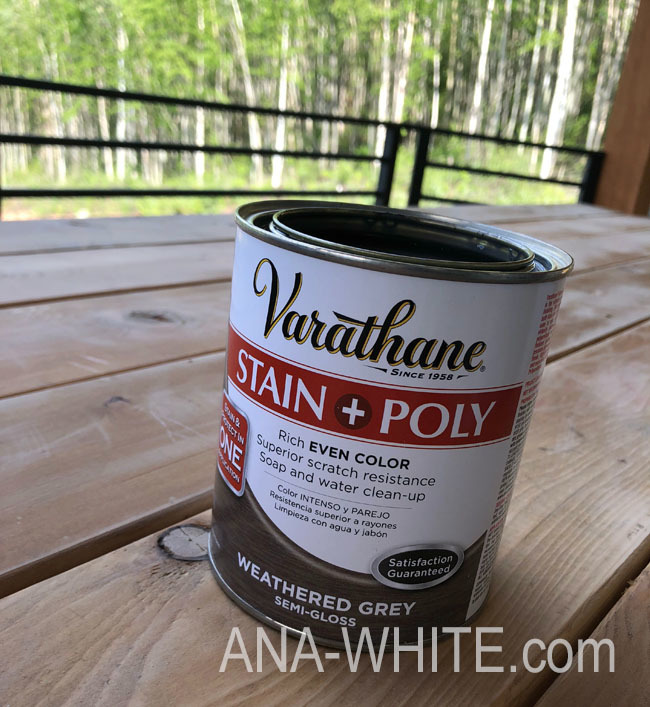 Varathane recently came out with a new product, Varathane Stain + Poly in Weathered Grey. Simply put, it is a grey-tinted polyurethane. 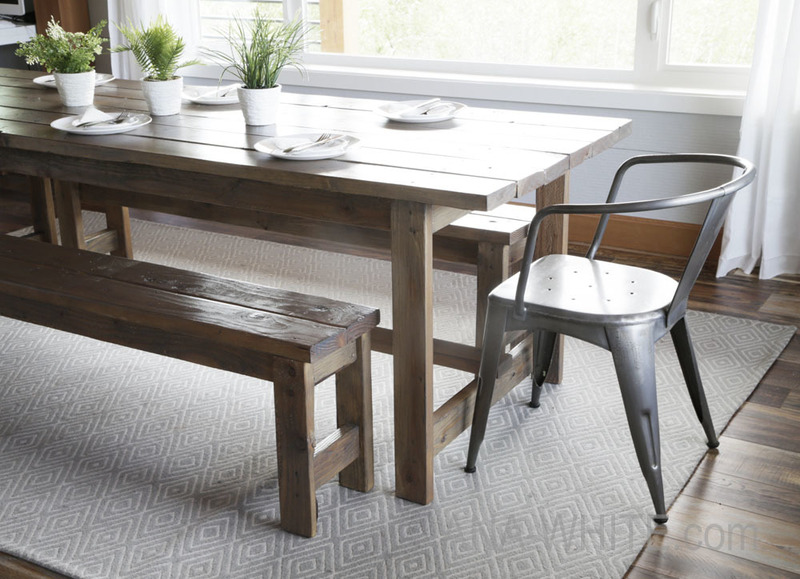 It can be applied just like a normal polyurethane, on bare wood or over a fully cured finish. Yes, you read that right – you can apply right over top of a finished piece, just like adding another coat of poly. 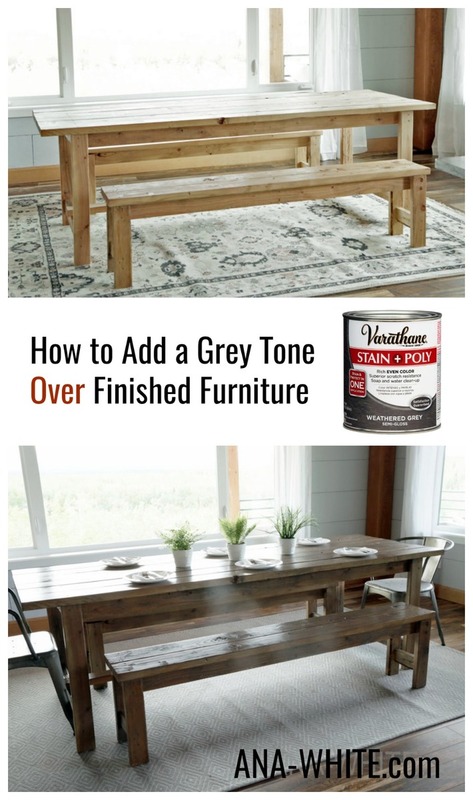 But it also adds a tint of color (like sunglasses) on top of the wood finish, and protects in one easy coat. This enables you to tint your project, even after it is finished. Tinted poly is a pro secret – tradditional wood stain can be unpredictable on wood, especially soft woods. 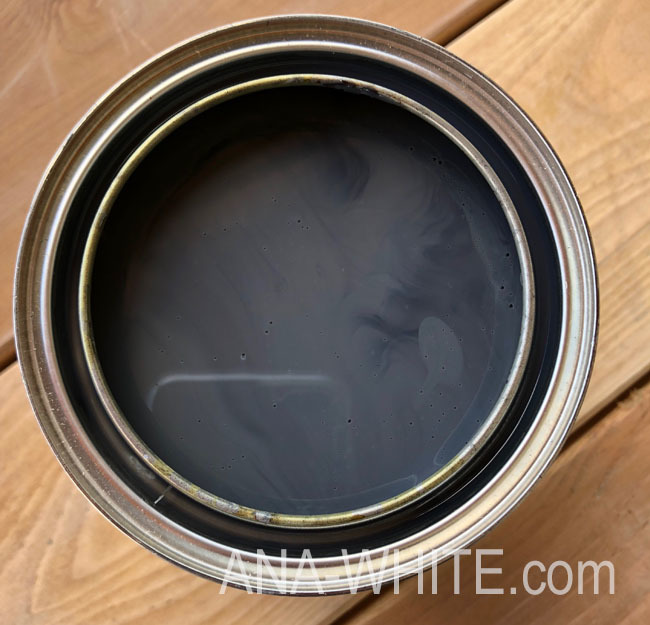 But with tinted poly, you are just adding a layer of tint on top of the wood – it doesn’t soak into the wood, removing potential for blotchiness or uneven color. 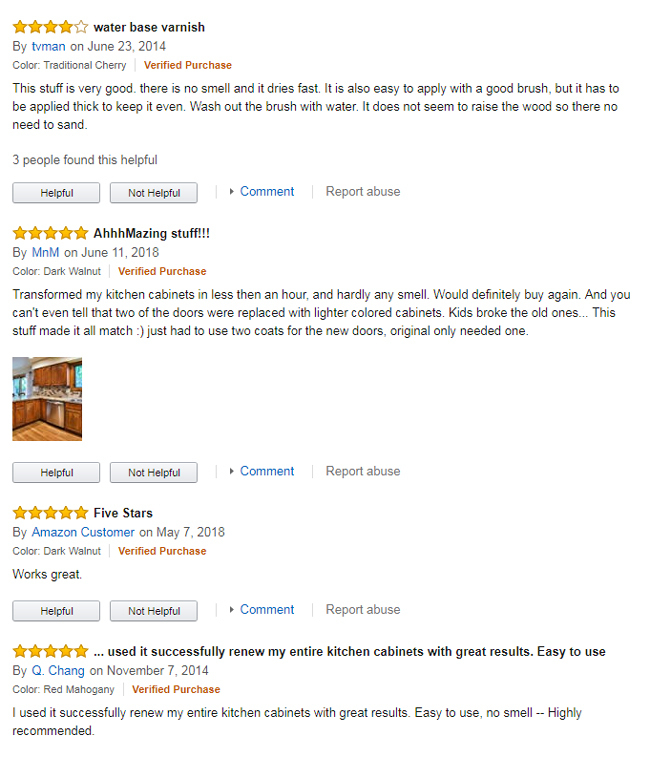 I first learned about tinting instead of staining when visiting high end furniture factories in North Carolina. At the factories, the raw wood was sealed first with clear poly, followed by coats of tinted poly. This created a consistent finish from piece to piece, and much more control over the final finish. 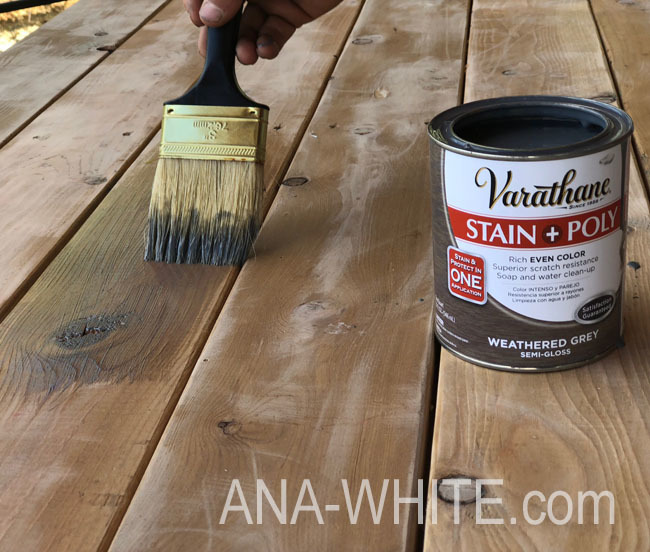 Now that Varathane makes a water-based Stain + Poly, it’s really a no brainer. Water-based polyurethane goes on smoothly and easily, has low odor, and cleans up with soap and water – making it very DIY friendly. A game changer really! If you are going for a very matte finish, pay attention to the sheen. I used a semi-gloss and it definitly has a little bit of a “wet” look to the final finish. You can add a final clear coat (use a water based poly) in a satin or matte sheen to dull the finish. 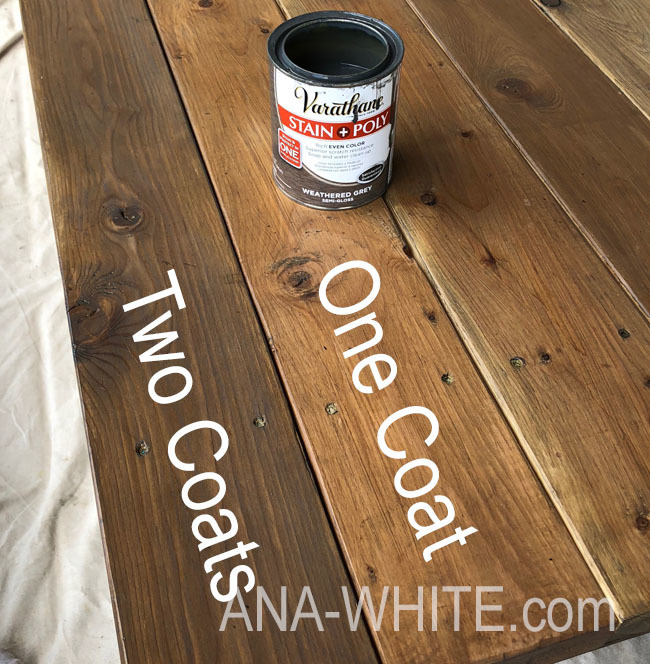 If you are working with bare wood that doesn’t necessarily need a final top coat (think low use pieces like headboards and dressers), tradditional wood stain may be a better option because it comes in more colors that are mixable and results in a flatter sheen. We gave the table a good cleaning. We had to sand off a few marker spots from the kids doing art projects, but the entire table did not need to be sanded. Then we just started brushing it on. I use a synthetic brush for water-based projects, with fine bristles and brush on in the direction of the wood grain. I start with one light coat. You can always add more, but trying to remove is difficult. One thing I’ve learned is a subtle change can result in a pretty big change overall on the project when it’s done. 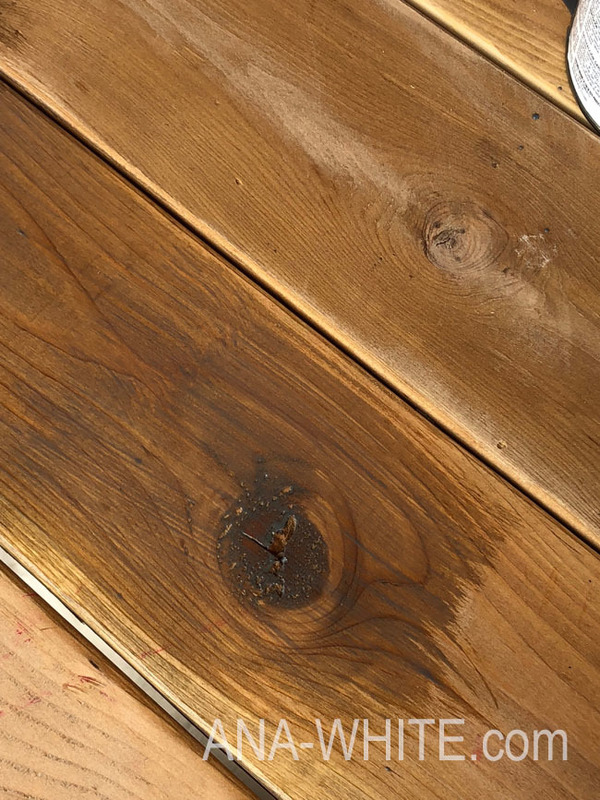 Here’ what one coat of the Varathane Stain + Poly looks like. I decided to add a second coat. This really deepend the color, but you can still see all the character in the wood. We love the final finish. It’s also smooth and even, buttery soft to touch. 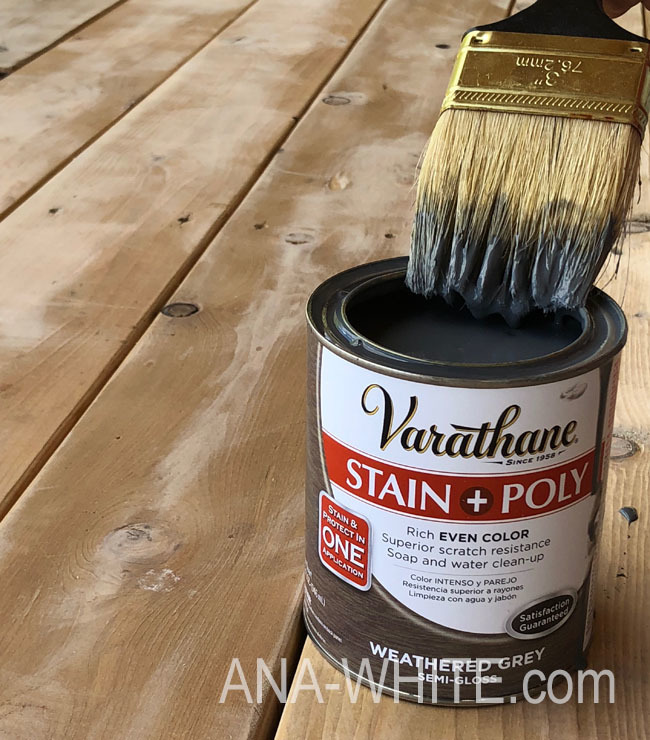 Varathane Stain + Poly comes in 14 colors, including Sunbleached, Ebony and Weathered Grey, and is available at Home Depot for about $12 a quart. I cannot wait to test out other colors and share the results with you. And do share your projects too – I love seeing what you come up with as well!